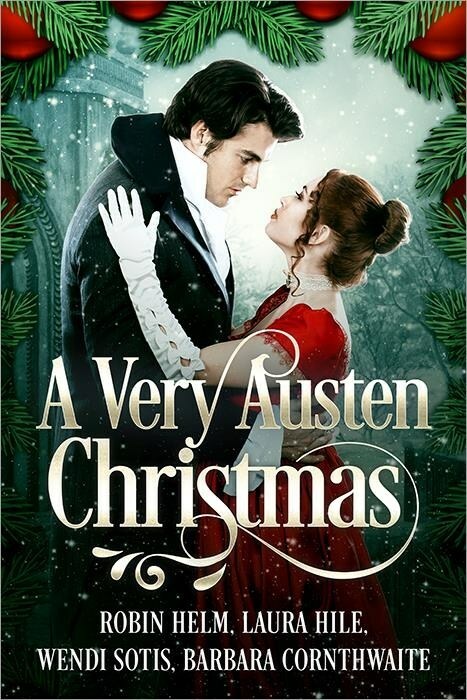 A Very Austen Christmas is the perfect anthology for this Christmas time and it gave me a tremendous pleasure to read it. It possesses the must have coziness, romance, humour, and even mystery this season requires and all with an engaging and quality writing. I felt transported to each one of them and that is not always easy to happen when I’m reading novellas. This book has four different stories that will appeal to all JAFF readers not because they portray different characters or different genres, but because they all have a different feeling and atmosphere that makes each one of them engaging and irresistible. Her Christmas Gift by Robin Helm was absolutely perfect for me and readers who usually like the same type of stories I do will certainly adore it! In this story, Mr. Darcy has a rival for Elizabeth’s attentions which allows him to be a little jealous and I always love a jealous Darcy! The first story on the anthology has romance, humour and the perfect Christmas tone that always makes stories cozy. I particularly loved to see Elizabeth playing Beethoven’s Moonlight Sonata as it is my favourite classic piece and I have always wanted to see it in a P&P variation. Robin Helm finally made my wish come true and the scene was just beautiful! I also loved Anne’s character, how she spoke to Darcy and how she plotted at matchmaking, it was an interesting detail. Her Christmas Gift has the coziness Christmas stories must have and I could not think of a better way to start the anthology, I absolutely loved it! The Christmas Matchmaker by Laura Hile has a magical touch in it that I was not expecting. The humour and romance are very present in it but I already knew that Hile is a master at that so I was not surprised, but the magical touch of Aunt Jane was really endearing and part of why I loved the story this much. Well…that and charming Darcy! He is irresistible in this story! Austen fans will adore this mash-up which brings together characters from Pride and Prejudice, Emma and Mansfield Park, and make it an incredibly funny and romantic plot with a little magical touch that will prepare each one of you for the Christmas spirit. I love The Gypsy Blessing by Wendi Sotis because it has a special feeling that is hard to explain but that got into me and that made me very expectant regarding No Better Gift. When I read it I realised it wasn’t the whimsical kind of story I was expecting but I definitely did not get disappointed! This short story is perfect in showing us why Darcy and Elizabeth are the perfect match. We really get to see why they love each other, and I just adore that. I could not put it down because of al the wonderful moments they have together and I know readers will love it too. Mistletoe at Thornton Lacey by Barbara Cornthwaite was clearly the biggest surprise for me in the anthology. I absolutely love Pride and Prejudice and Mansfield Park cannot compete with it when it comes to my affections, so I was not expecting to love this story so much, but the truth is I loved it as much as I did all the others who have P&P characters, so I would dare to say that everyone will love it! Mistletoe at Thornton Lacey is tremendously funny and I had a great time seeing Edmund Bertram’s efforts to declare himself to Fanny Price. Even though Tom Bertram and Susan Price did their best to help Edmund in this endeavour, fate seemed to be against him, until mistletoe came to help that is. The ending scene was adorable and I loved seeing this new side of Edmund, it made me love him a bit more than in the original. Just like Her Christmas Gift was the perfect way to start this book, Mistletoe at Thornton Lacey was the perfect ending. A Very Austen Christmas is an anthology of stories that will transport you into the homes of our most beloved characters and feel the Christmas essence along with them. You can either read them one by one or read the entire anthology non-stop like I did, but I know for sure you will not regret it, the book is just what we need for Christmas. My heartiest congratulations to the authors for coming together and creating a must read book in the Christmas season! Robin Helm, Laura Hile, Wendi Sotis and Barbara Cornthwaite would like to offer one of my readers their very own Christmas present! They have one ebook ready to be delivered to one of you, or a person of your choosing, on the 24th of December or the 25th if you’d prefer. All you have to do is leave a comment on this post until the 23rd of December mentioning your email. If you do not want to publicly post your email, or if you’d like to offer this ebook to someone else, please send me an email to ritaluzdeodato at gmail after commenting, this way, we will be ready to send out the ebook on the 24th to the lucky winner shortly after we announce it here at From Pemberley to Milton. Chocolate and Christmas festivities and that fine man, Darcy, tool? Be still my heart! Thanks for entering the giveaway, Ria. Good luck! I think I’ll eat chocolate WHILE reading A Very Austen Christmas! Thank you, sweet Sophia Rose! I’m thinking this will come after Christmas. Unless we get a massive dump of snow before then and are forced to stay a home, in front of the fireplace, with hot cocoa and books. Good luck in the giveaway, Eva. I have a houseful of company now, and it’s wonderful! No quiet time to read, though. It will be very quiet here Christmas day, so I’ll read then. Good luck, evamedmonds! I was lucky enough to win this book from another stop on the tour. But, Amazon.com won’t send books out of the US anymore so it didn’t give me the option to accept it. Luckily Robin was able to send the file for me to download and e-mail to my kindle so I mow just have to find the time to read it. I believe Abigail Reynolds was hoping to query this with Amazon as it will affect international giveaways. So fingers crossed they go back to the old method. Right, Glynis? What is up with that? Robin and I were scrambling to figure out a way to get that eBook prize to you. I had a similar problem sending an eBook to Rita! My French is rusty, but I can figure out how to gift a book. 🙂 But Amazon wouldn’t let me do that through Amazon.fr. I was told to use the dotcom site. Then poor Rita activated an account on Amazon.com, but she could not get the book. Hi, Glynis! I wonder if had anything to do with the currency change that day. Maybe Amazon balks if the US currency is rated lower than the UK currency. No clue! Glad you got your book, though. Merry Christmas! Lovely review Rita! All the stories sound wonderful and I look forward to reading it! Thank you for a chance at the giveaway! Merry Christmas and Happy New Year! A Merry Christmas to you too, Carole — although I cannot believe it is now the right time to be saying that. Where does the time go? Good luck in the giveaway It’s exciting to think that the winner will get our Christmas book right in time for Christmas!. Hi, Carole! I hope you enjoy the stories. This anthology sounds wonderful! Thanks for the chance to win! Hi, Kim! Thank you for entering our giveaway. It’s so great to have it come right before Christmas. Because we each get busy buying gifts for everyone else — and this prize will be a happy surprise. Hi, Kim! We hope you enjoy it! Good luck! Barbara did a wondrous job with Mistletoe at Thornton Lacey. I loved it. Good luck in the giveaway, Vesper. You’ll love Barbara’s story, Vesper. I hope you have good luck in the giveaway! Thanks so much for the wonderful review and for hosting the giveaway, Rita! Good luck to everyone who enters! Thanks to Rita for hosting and to our authors for this generous give-a-way. I just looked on Amazon and this book has a ‘Best Seller’ tag. WooWoo!! Just saying. I can’t wait to read this. I love that cover. We still marvel over that Best Seller tag. And the beautiful cover too. That Darcy, he is one fine man! Good luck in the giveaway, J.W. It’s fun to think that the winner will get this for Christmas. Yes, we very much appreciate Rita’s hosting us. Enjoy, enjoy! Thanks for commenting, J.W., and good luck! What a lovely gift!!! Thanks for he review and giveaway. Early merry Christmas! Merry Christmas to you, Priscilla. (And isn’t it something that the year is almost over?) Good luck in the giveaway. It’s such fun to do this, and to think that somebody is going to get an early Christmas present. Hello, Priscilla! Thank you for commenting. Good luck! How we love the quiet that comes after holiday celebrations — spent in the company of family and books. Thanks for entering the giveaway, and Merry Christmas! Hello, Christina! Great to “see” you here. I hope you enjoy our stories! Christmas is my favourite holiday season and I love that there are four stories to read in one book. Thank you for sharing your thoughts on A Very Austen Christmas, Rita. Would love to win this book. Merry Christmas, Luthien. Good luck in the giveaway! Christmas is my favorite time of the year, too, Luthien! My husband really enjoyed the “three novellas and a short story” format of this book. He was busy, so he didn’t want to commit to a full-length novel. He truly enjoyed all four stories. What a nice review, the more I hear about this book the better it sounds. Love Christmas and everything Austen. We love Christmas festivities too, Charlotte. Merry Christmas, and good luck in the giveaway. Hi, Charlotte! I thought Anna did a spectacular job of reviewing A Very Austen Christmas. Thank you for entering the giveaway. Good luck! Just what is Austen fans need at Christmas!!! Looking forward to reading this one,it sounds so nice! Mary, thanks for the kind words. This giveaway is exciting for me because I’ll be sending the winner’s eBook on Christmas Eve. Good luck in the giveaway! Read this, loved this and reviewed this….recommend it to all. Great review. Thank you so much, Sheila! We all loved your review. Merry Christmas! Sheila, thank you for stopping by to encourage us. Merry Christmas! The book sounds lovely! Thank you for a chance to read it free! Yippee!!! Thanks for entering the giveaway, Analisa. Merry Christmas! Merry Christmas, Patricia! Thanks for your interest in our book.